Paper Tiger, 09/28/2000. Hardcover. Used; Good. **WE SHIP WITHIN 24 HRS FROM LONDON, UK, 98% OF OUR ORDERS ARE RECEIVED WITHIN 7-10 DAYS. We believe you will be completely satisfied with our quick and reliable service. All orders are dispatched as swiftly as possible! Buy with confidence! Chrysalis Books Group. Hardcover. 1855858509 160pp. (black spine) 4to. 2000. First edition. 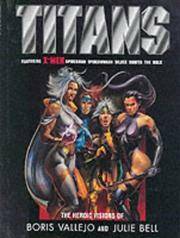 The sub-title should read 'The heroic visions of Boris Vallejo and Julie Bell'. A lovely, clean, tight very good plus copy in similar wrapper. No inscriptions. The text supported by numerous photographic reproductions of the artists' work in colour. Some slight print marks to the title page. A light bump to the tail of the spine with some light associated creasing to the wrapper. Light shelf wear to the wrapper which has not been price-clipped. A lovely copy. . Very Good. London. : Paper Tiger., 2000. 160pp, colour illustrations. 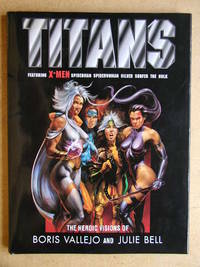 Featuring X-Men, Spiderman, Spiderwoman, Silver Surfer, The Hulk.. First Edition. Hardcover. Near Fine./Near Fine. Folio - over 12" - 15" tall. Paper Tiger, 2000. 160pp. book in VGC+ The dust cover is in VGC slightly rubbed top and tail spine. Small tear top and tail spine. A few surface scratches on the lamination.. First Edition. Hard Cover. Very Good +/Very Good. Illus. by Vellejo and Bell. Folio - over 12" - 15" Tall. London: Paper Tiger, 2000. 160pp; light edgewear to d/j, pictorial boards similar to d/j.. Hard Cover. Good/Good. Folio - over 12" - 15" tall. Chrysalis Books Group. Hardcover. 1855858509 Please allow 4 - 14 business days for Standard shipping, within the US. Thank you for supporting our small, family-owned business! . Fair. 2000-08-31.